Jim Lee wears a lot of hats these days. 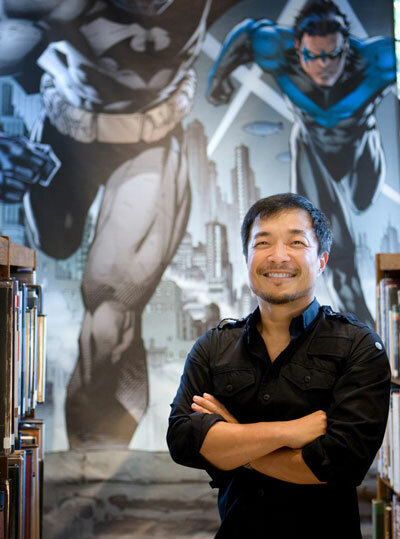 As co-publisher of DC Comics, he’s spearheading the publishing giant into the digital world. He’s also running his own DC-owned imprint, WildStorm, and he serves as creative director on Sony Online Entertainment’s DC Universe Online massively-multiplayer online (MMO) video game for PC and PlayStation 3. Lee makes his 25th trek to San Diego Comic-Con this week. The artist took some time out from his busy schedule – his cover for the new Justice League Issue #1 comic is on the cover of the official San Diego Comic-Con souvenir book – to talk about video games, motion comics and 3D movies in this exclusive interview. What role do you see DC Universe Online playing today in the overall DC Entertainment business? The DC Universe Online game is a great way of introducing people to the overall DC Universe world because it’s not just about the key franchises, it’s not just about Superman, Batman and Wonder Woman. It’s about the entire breadth and depth of the DC Universe, including characters like Ambush Bug, Cheetah, and Hawkman. We get to really show what these great creative minds have created in the past decades to a new audience. Will DC Universe Online players be seeing more DLC content versus the traditional expansion packs? Rather than do an expensive expansion, the strategy is to do more affordable, economical downloads that add very interesting content. The Green Lantern DLC costs $9.99. Obviously, people have been asking for the Lantern light power set since the game launched, really. We finally got the opportunity to do that. It’s called Fight for the Light, and it’s a great overlay of power on top of existing power sets and adds new areas where characters can adventure, and either partner with or against some of the favorite heroes like Guy Gardner or villains like Sinestro. 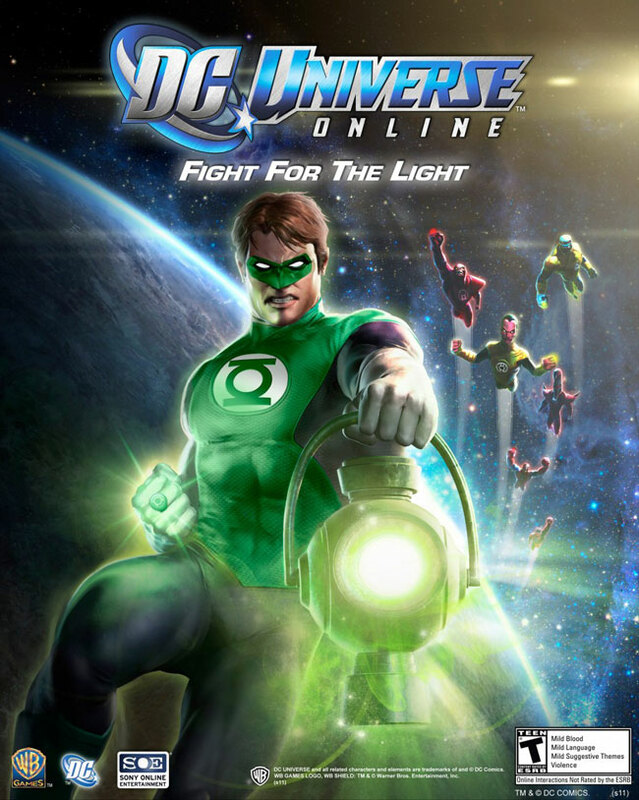 The release of this DLC is coming around the theatrical and upcoming home entertainment launch of the Green Lantern movie. Do you see this laying a groundwork for other cross-media Hollywood tie-ins when you look ahead to the new Batman and Superman movies coming out next year? There’s always that possibility or that opportunity. Obviously, there’s a certain amount of lead time you need to put things into the pipeline in the video game space. We’re always looking to tie into bigger events that affect the entire DC Entertainment portfolio business suit. Green Lantern and all of the Marvel superhero movies that are coming out now are in stereoscopic 3D. What do you think 3D adds to the comic book movie experience? Green Lantern worked very well, and it handled the 3D. Superhero movies work well in 3D. You have the whole history of superheroes. It’s always been about foreshortening and really taking the images, putting them in your face, and making them bigger, bolder and more dynamic. It’s about the characters standing not just shoulder-width apart, but two times shoulder width apart, standing not your typical six or seven heads high, but maybe twelve to fourteen heads high. Are there similarities when it comes to the video game space, where Green Lantern: Rise of the Manhunters was released as a 3D game? Absolutely. The superhero genre works so well when it comes to 3D games. It’s all about the protagonist and antagonist, ying versus yang. When you’re in the video game space, it’s about applying the items, applying the cool objects, defeating the villains, finding the new levels and worlds to explore that are more fantastical or beyond anything that you could have even imagined. To me, that’s the bread and butter of comic books. What’s the latest when it comes to the DCUO comic book series that launched with the game? We have DC Universe Online that we publish bi-weekly in support of the game. It has found its audience and it’s doing very well. We’re excited to see that there’s potentially new people that are coming into the gaming space because of DCUO and are checking out the world of comics. We offer that as a digital comic book, and that’s part of drawing the overall audience mission that we have. 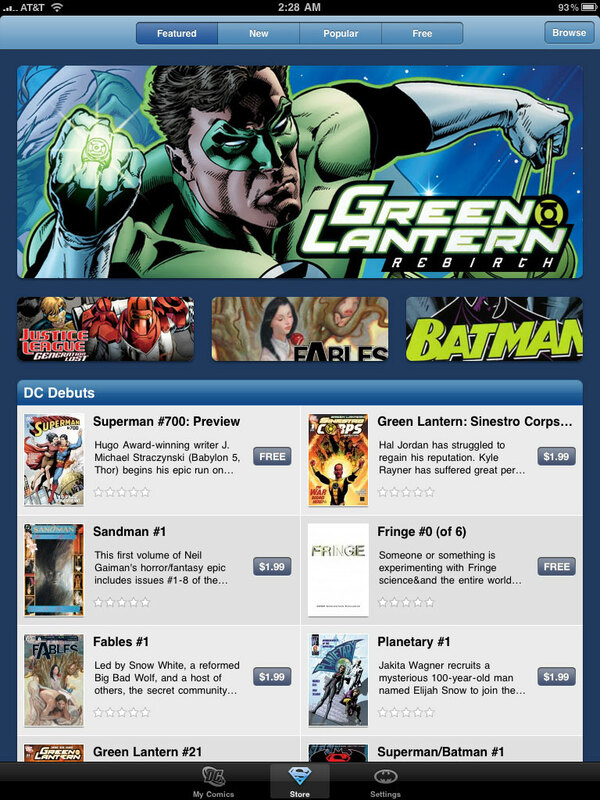 How have new tablets impacted the comic book industry in this digital world? You need your phone for communication. An iPad is a great luxury item that really has changed the world of digital comics in that it has been a real game changer, because it’s almost the perfect size screen for reading an entire page, and then you can also go from that to a panel view. It also allows you to store a lot of comic books. The lushness of the screen and capturing the colors of the page have been real game changers. We also offer our comics library. You can buy it through Comicazi.com or DCComics.com through a Web portal. What role do you see digital comics and motion comics playing in the comic book industry moving forward? Motion comics have not seemed to find as much traction amongst this audience. It inhabits this world in between print and animation, and it showcases the shortcomings of both when you go between those two end points. If you start animating things, people want more, and they want it to be full-on animation. If you don’t animate things, then people feel like it shouldn’t be called anything remotely like motion or animation. It should just be print, obviously. There’s a challenge there. How do you see overcoming this challenge? Motion comics require a bigger budget, and as such I think have required a different marketing campaign for finding a true audience than currently exists. It’s probably more costly than doing something like rolling out just a digital comic book. What are your thoughts on reading comics digitally versus in print? For me, reading a comic book on a monitor always feels like work because I’m sitting in there at a computer screen looking at the computer screen. That very much to me, as a creator, feels like I’m working rather than reading for pleasure. If I had to give up one, it would be the desktop experience.